When Trump became president, we knew Yellen’s time as Fed chair was almost done. He criticized her on the campaign trail heavily. After he became president, his tone softened on her work because she was essentially an employee of his even though the Fed isn’t technically part of the government. Yellen’s support of regulations is what did her in because Trump is in favor of deregulating the banks. He liked her decisions on rates because he thinks she was a dovish chair. His Fed chair hopes were for a dove who supports deregulation because he wants economic growth. Now that Yellen’s time as Fed chair is over, it’s important to look back on her 4 year tenure because it gives us perspective as we look into the next 4 years of monetary policy. It’s also worth noting that the next few years of economic performance will affect her legacy. Greenspan is blamed for the mortgage crisis even though it happened under Bernanke’s watch. Janet Yellen was left in a precarious position when she started the job as Fed chair in early 2014 even though the financial crisis was over for about 6 years. Yellen presided over the beginning of the normalization process for monetary policy. As you can see from the chart below, QE 3 ended right before Yellen was sworn in. 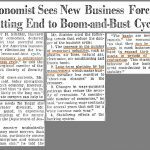 This was a tough position to be in because each previous time a QE program was ended, another one was put in place soon afterwards as Bernanke was afraid the economy couldn’t stand on its own two feet. The Fed funds rate was still at zero when she took the helm which is unprecedented. Yellen was able to avoid the temptation of doing another round of QE. She then started the rate hike cycle which the stock market was very squeamish about. She raised rates one quarter point in 2015, one quarter point in 2016, and 3 quarter points in 2017. A number of systemically important global central banks injected massive amounts of liquidity in the face of economic weakness in 2016, thus delaying a recession from happening. This was a pivotal moment in Janet Yellen’s tenure even though the Fed didn’t do anything besides maintain the speed of 1 hike per year. 2017 was the first year where the normalization process really got going as the Fed actually met its original goals for the year in terms of policy as the economy became stronger. The decision to ignore the low inflation, calling it transitory, was pivotal. Declining wireless prices often received Yellen’s ire as she maintained the path of rate hikes. How terrible that technology improved and prices decreased, right? Then in October, the Fed started the balance sheet unwind slowly as $10 billion per month was allowed to expire. In January 2018, that amount was increased to $20 billion. Yellen will be most known for having very clear guidance. Sometimes the Fed didn’t meet its targets, but she always made the market aware of what the Fed was thinking. This clarity can be understood to be an extreme reliance on forward guidance which is a derivative of policy. Yellen’s tenure was amazing for stocks as there weren’t many corrections; the time from the election until she left was one of the best runs for stocks in history. She didn’t make any serious threat to raise rates to prevent an equity bubble even as stocks reached the 2nd highest valuations ever. She extended the life of the recovery making it potentially the longest expansion in modern history, currently the third longest expansion since 1854. We’ve painted a great picture of Yellen’s tenure because it will look great until the next crisis hits. Then, historians and economists will debate over who gets the blame. The biggest criticism Yellen should get is missed expectations for neutral rates. The neutral rate is supposed to be an interest rate where GDP grows at its trend and inflation is stable. As you can see from the chart below, Yellen mentioned the neutral rate the most by far. That’s a big deal because the Fed also spoke more often than under the other fed chairmen. 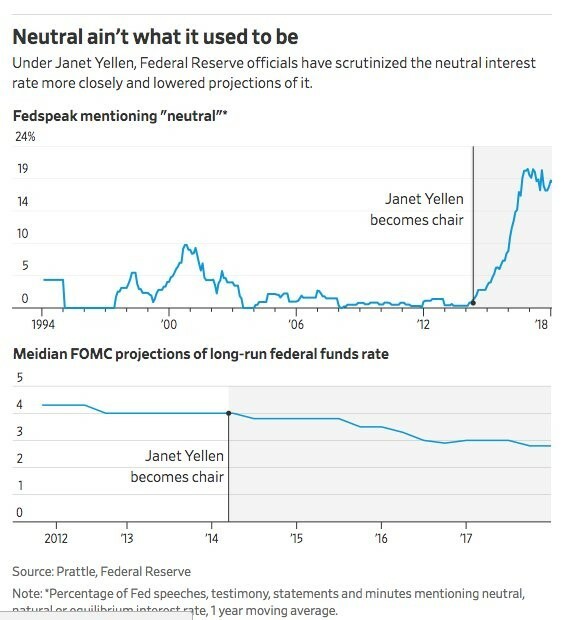 As you can see from the bottom chart, the neutral rate fell after she became chair. She moved the goal post for the long term Fed funds rate and still didn’t hit it. The concept of a long run rate is confusing because you wouldn’t expect that to change as often as other projections, but it has. The projection below is laughable. 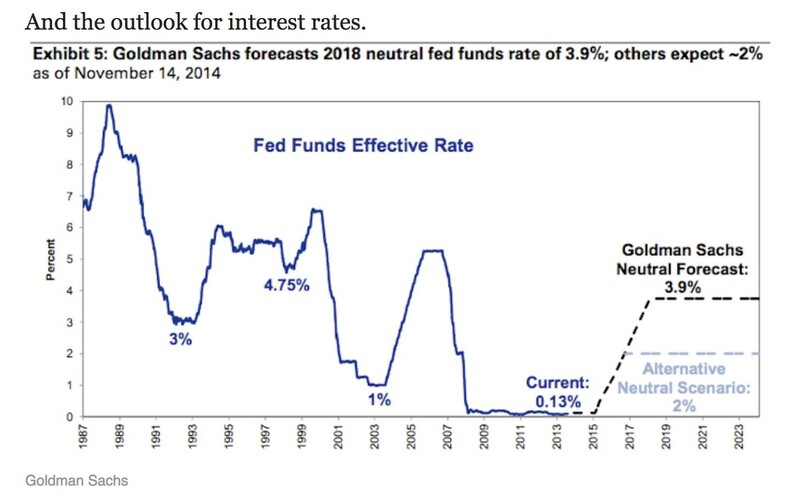 As you can see, Goldman expected the 2018 neutral Fed funds rate to be 3.9%, but as of February 2018 it was 1.3%. The alternative neutral scenario listed above is close to being spot on as the Fed Funds rate started the year at 1.3% and is expected to end the year at about 2.05%. 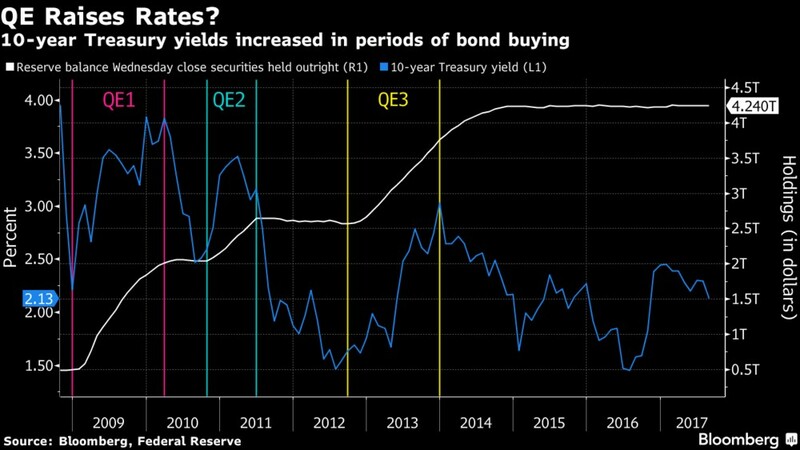 If you look at the chart which showed the timeline of QE, the title shows QE raised rates which goes against common sense. Some investors decided that QE caused the 10 year bond yield to increase because it increased growth prospects. The higher growth made up for the bond buying which suppresses rates. That theory goes on to predict that rates will not rise when QE ends and the unwind starts. That started to work out, but then in the summer of 2016, that theory started to be incorrect. Ever since yields bottomed, the sell off in 10 year bonds made sense because the Fed didn’t expand its balance sheet in 2016 and started shrinking it in 2017. Now, the selling is leading to higher yields unlike the illogical trend which popped up during QE. As the Fed picks up the pace of the unwind, the yields might increase. 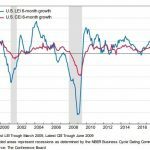 The other aspect of the change in the yield trend is that economic growth has picked up cyclically. 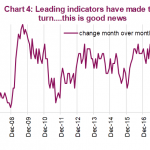 Then the tax cut boosted growth expectations further in 2018. You can argue, the Fed’s QE and unwind have minimal effects on the bond market because there isn’t a consistent relationship. Some disagree, saying the Fed financed the huge government deficits with QE. 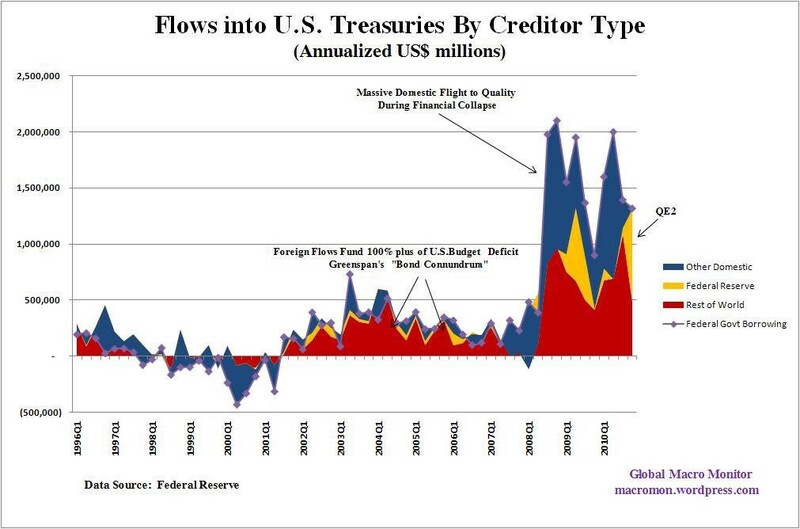 As you can see from the chart below, the Fed helped provide demand for treasuries when there were high deficits. The effect of the balance sheet unwind will determine the legacies of Bernanke and Yellen. The scary part of the unwind is that it picks up significantly when the government is expected to have high deficits partially because of the tax cut. 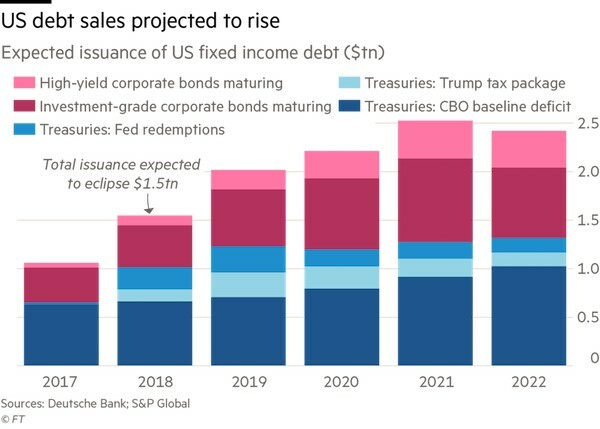 As you can see from the chart below, the fixed income debt in America will increase in 2018 and 2019 along with the unwind. This could cause yields to rise which would cause deficits to skyrocket. That could result in a debt crisis which would be blamed on monetary and fiscal policy. Yellen’s four year term was flawless if you ignore the potential effects of her policies in the future. 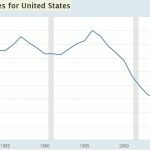 While there will be lots of blame to go around, a significant portion of it will be on the government because it has run huge deficits for decades. The QE was done by Bernanke so he’ll get more blame than Yellen. However, if there’s a crisis 1-3 years after Yellen leaves, she won’t escape criticism.